A pre-arrangement by European soccer’s governing body, UEFA, has proved useful again in keeping Armenia and Azerbaijan separate during a Sunday draw for Euro-2016. At the ceremony held in Nice, France, Azerbaijan was put in Group H from the fifth-seeded pot – minutes later the organizers drew Armenia from the fourth-seeded pot into the same group, which triggered the earlier announced UEFA mechanism to keep the two regional archrivals apart. 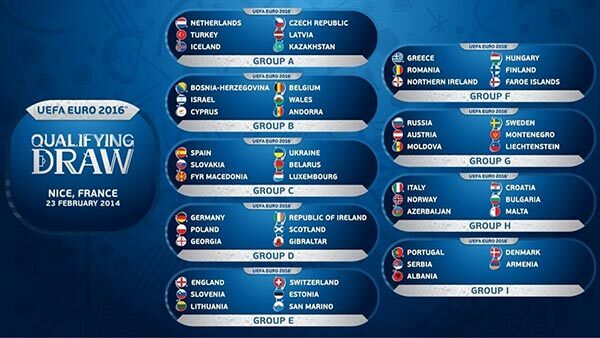 Eventually Armenia was placed in Group I together with Portugal, Denmark, Serbia and Albania. Armenia and Azerbaijan that warred in 1992-1994 and are still locked in a bitter dispute over Nagorno-Karabakh caused trouble to UEFA after failing to agree on the match venues in the Euro-2008 qualifying campaign in which they had been inadvertently drawn together in one qualifying group. A similar pre-arrangement already helped UEFA keep the two foes apart during the Euro-2012 draw four years ago. Interestingly, it is the first time that Armenia has been placed in a group that consists of only five nations. The other eight groups feature six nations each. Only two teams from each group will qualify for the Euro-2016 finals directly, as will the best third-placed team. The other third-placed teams will go into play-offs for the remaining qualifying spots. The European championship finals are due to take place in France on June 10-July 10, 2016.